Do you love lasagna, but think it just takes way too long to make? 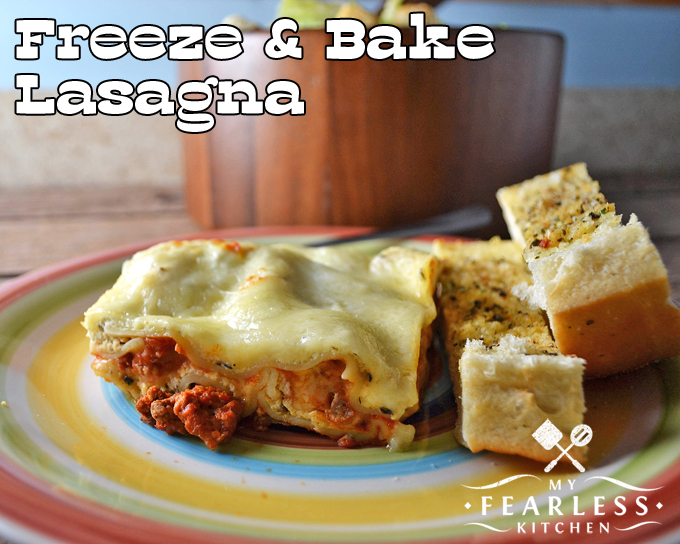 This recipe for Freeze & Bake Lasagna is just what you need! Make one for dinner tonight and one to put in your freezer for later. He doesn’t get to eat lasagna very often because I don’t want to make it very often. Brown the meat, mix the cheeses, boil the noodles, then wait forever for it to bake… Who has time for that, especially on a busy weeknight? Not this work-at-home farm mom, for sure! 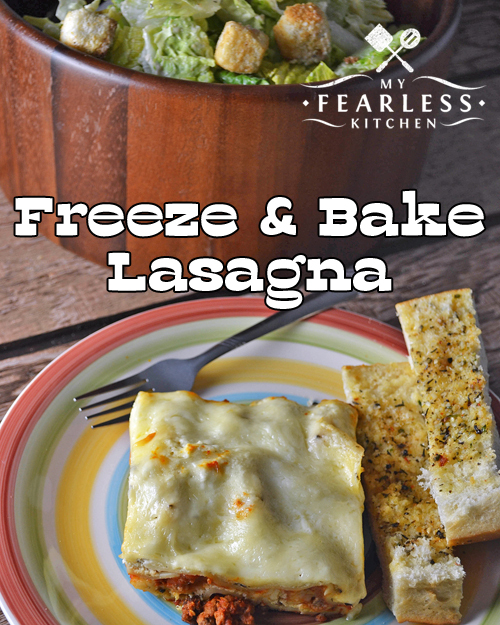 Then I found this recipe for Freeze & Bake Lasagna in Gooseberry Patch’s cookbook “Our Favorite Freezer-Friendly Recipes”. And lasagna night just got so much easier! You can make this ahead, anytime you want. Get it prepped in the morning or the night before, keep it in the refrigerator and bring it out to bake. I always make two – one for dinner that night (or the next night), and one to put in the freezer for a rainy day. Did I mention the best part? Not yet? Well, you are just going to love this. You don’t need to boil the noodles! That’s right… Use regular lasagna noodles, and layer them uncooked. There is plenty of sauce so the noodles will get nice and soft by the time everything is cooked through. Oh yeah, lasagna just got so easy! Silly story… the first time I made lasagna, I had no idea how to boil these long, flat noodles. I didn’t have a pot that would even come close to fitting them. So I used a 9×13 cake pan, filled it with water, and put it across two burners on my stove. And I boiled the lasagna noodles in that. It got the job done, but I’m sure it looked funny! And now, never boil lasagna noodles again! When you’re ready to make a lasagna for the freezer, prep everything the way you would if you were getting ready to bake it right away. Except you probably want to use a disposable pan, instead of one of your good pans. Then follow the tips in this post for easy freezing, every time! Pull-Apart Garlic-Parmesan Garlic Bread – the perfect side dish! And speaking of changing things… this is the absolute perfect garlic bread recipe to go along with this Freezer & Bake Lasagna. Once you make this Pull-Apart Garlic-Parmesan Garlic Bread recipe, you’ll wonder how you lived without it! Brown ground beef, onion, and garlic in a large skillet. Drain. Add spaghetti sauce. In a small bowl, combine ricotta cheese, egg, and seasoning. In a 9" x 13" pan, layer ½ the meat mixture, uncooked noodles, ½ the ricotta cheese mixture, 1 cup of Monterey Jack cheese, and 1 cup of mozzarella cheese. Repeat layers. Cover with aluminum foil. Bake at 350 degrees for 90 minutes. Make lasagna in disposable 9 x 13 pans, if desired. Cover tightly with plastic wrap and aluminum foil. Thaw overnight in the refrigerator. Remove plastic wrap and bake, covered with foil, at 350 degrees for 90 minutes.